Hello, friends! I haven't updated in a while because I've been in Italy the past couple of weeks. It was a big undertaking to plan such a long multi-city trip in a foreign country. There is so much I learned along the way that I'd love to share with you in case you are ever considering a trip to Italy. If not, enjoy the pretty pictures. Italy is a gorgeous country! 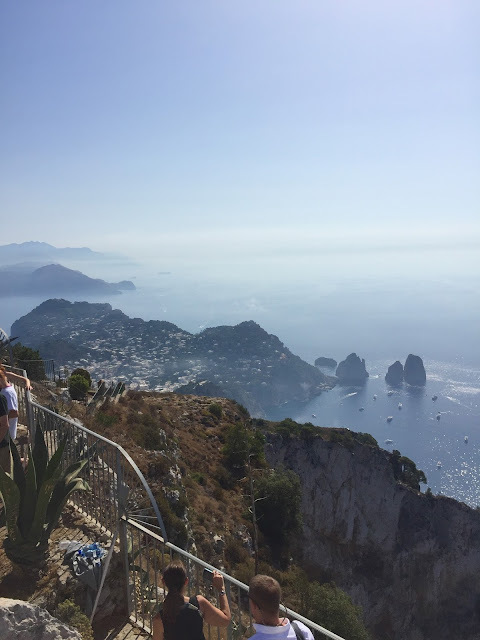 We arrived in Naples, took a bus to the port, boarded a ferry, took a tram and walked up a million stairs to the cutest piazza in Capri. The best part is when we turned around and saw this view. All of that traveling was worth it! We then used google maps to navigate the streets to find our hotel, the Regina Cristina. The town area of Capri is small and you can easily walk the streets to find your hotel. Our hotel offered us a welcome drink and since it was 100 degrees outside so my husband and I just asked that it be cold. The bartender recommended a limoncello spritzer and that sounded amazing. We both fell in love with this drink and have been making them at home as well. It's one quarter limoncello and three quarters prosecco. At the hotel the bartender added a splash of blue curacao, but it's not necessary. It had been so long since I booked the hotel that I didn't remember much about it so I was pleasantly surprised to find out that we had a balcony with a sea view. The room was more functional than luxurious, but the fabulous air conditioner made up for it! Then it was time to walk the streets and see the town! The streets are charming, the flowers and lemons blooming, and the stores extremely luxurious. I had some major lemon envy while I was there. I've been trying to grow lemons and I have exactly one that's still small and green. I check on it almost daily so to see the trees dripping with lemons half the size of my head was amazing. My lunch view was perfect for people watching while drinking limoncello. This was my favorite street because it was a bit quieter so you could take it all in. After lunch we went on a boat tour of the island. We had a private guide and at 150 euros for 2-2 1/2 hours it was worth every single penny...I mean euro. It was one of the highlights of our trip. The scenery is just gorgeous and the breeze felt wonderful. We stuck our feet out of the side to cool off in the water while drinking prosecco. Eventually we went for a swim too in one of the small coves. We toured at least 12 caves in the area, but we didn't see the blue grotto because there's a 45 minute line to get in. The tour guide said it wasn't worth it so I took his advice. I found most Italians have no problems telling you what you should eat, drink and see. They never steered me wrong so I welcomed all of their advice. I saw the most enormous yachts that would take up half of my neighborhood. This isn't the biggest one, but I got a kick out of the bouncy house attached to it for their kids. I could see them jumping up and down as we passed. I would like to be a kid in this family! The beaches tend to be very rocky so a boat ride is a must. These people do not look comfortable! 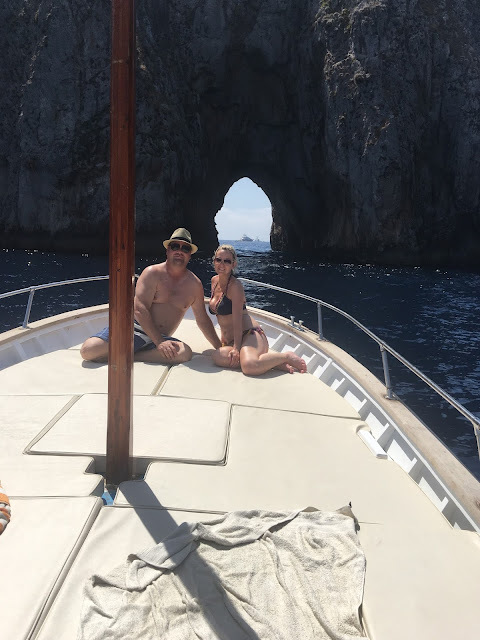 We only spent two nights on Capri and I honestly don't know what we would have done a third day so it was the perfect amount of time. We headed back to Naples to take a three hour train ride to Florence. We had only one night here because there wasn't much we wanted to do. We have seen our fill of churches and museums on other trips, which is pretty much all there is to do in Florence. It is an absolutely beautiful city though and I'm so glad we didn't skip it. I enjoyed walking around this medieval town eating gelato on the narrow cobblestone streets the most. We did go to the Pitti Palace because I do enjoy a good palace or castle. I also love touring gardens, but not so much when it's 104 degrees outside. It would be so much better in the spring. The palace apartments were a little strange because it was just room after connecting room with no hallways. I imagine it would take 20 minutes just to get to one of the back rooms. It reminded of me when I was a kid and tried to draw a floor plan of my dream home that never included a hallway and you had to walk through the kitchen to get to a bedroom. Our ticket also included a visit to the Bardini Gardens, but there was no way we would attempt another garden in that heat. We opted to drink local wine in the a/c while people watching instead. It was a lot of fun because we were one of the only people there and had a great time talking to the waiters. I got a kick out of it when they thought we were from Australia. Whenever we travel people never guess American even with our Texas accents. One of the Canadians we met on this trip said it was because we didn't have the Dallas twang. I didn't even know Dallas peeps had a different accent, but I guess it makes sense because many Houstonians aren't even from Texas. The next day I slept in because the heat had gotten to me so by the time we got to the Duomo there were already what looked to be 1,000 people in line. I had zero desire to stand in line so we had what was became my everyday breakfast, a cappuccino and a chocolate croissant. At least we had a great view of the Duomo while sitting directly under the air conditioning vent. It's pretty much a miracle this shot happened because there were hundreds of people around me. I had on my "church dress" that day. Knees and shoulders have to be covered in the churches so I found this Michael Stars dress online that just covered the knee. I had a scarf in my bag to cover my shoulders too. Many of the tourists brought two scarves, one to tie around their waist and one for their shoulders. It was so hot that I wish I would have done that instead. I didn't expect the dress to be quite so clingy. My husband joked that my church dress was my most revealing dress. I bought this one because it was cotton and didn't want to sweat in something dry clean only, which was a good call after getting a sniff of it the next day. I also made sure to buy a tote bag with a zipper because pickpockets are notorious in Florence. You will see many women traveling abroad with this same Longchamp bag that comes in different colors. Most of the time I wore my crossbody wallet-on-a- chain (WOC) unless I had something I needed to tote around. I could also stick the crossbody bag inside of the tote so I never had to switch bags. At night, I shortened the crossbody chain and wore it as a small shoulder bag the size of a clutch. It worked out perfectly! Then we were off to the Tuscan countryside! The main reason for this trip was to go wine tasting because it's one of the things my husband and I both equally enjoy. The older I get the more I love the country too. I read Under a Tuscan Sun when it first came out in my 20s and I never thought in a million years I'd actually be here. It's even more beautiful than I imagined. I couldn't wait to get started so we went to a large winery on the way to our hotel. It said wine tours until 5pm so I thought we would pop in. It turns out the tours are at 1pm and 3pm, and last 1.5 hours. We got there at 1:30 so they did an improvised tasting in the restaurant. It was a little awkward and the wines were just okay. I'm wondering if we had shown up for the tour if it would have been a better experience. It's highly rated so I would definitely try it again. I realized Italians don't do much business online in general so it's best to call for information. It's probably because of the spotty wifi we experienced in every part of the country we toured. We stayed in Chianti at a small hotel. I had wanted to stay near Siena so we could be more centrally located, but I couldn't find a hotel I liked. 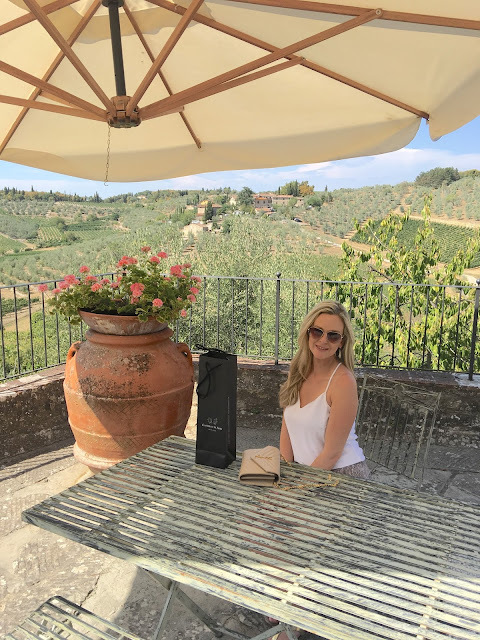 I realized after touring the various areas of Tuscany that I was drawn to Chianti because it's definitely has the most beautiful views. Our hotel was small with only 17 rooms and felt more like a B&B, which I've always shied away from because I felt like they weren't private enough. I was so wrong! We got to know the staff and the other guests like I never have in a typical hotel, but still maintained our privacy. The restaurant on site served the best food I had in Italy and we ate there all three nights we were there. The lasagna was our favorite and I loved that it had a béchamel sauce instead of a typical tomato sauce. I'm definitely going to try this at home. If I could just learn to make the pasta fresh! This was the view of the villa next to us at dinner. I had ordered roasted potatoes with rosemary one night and the chef came out to handpick the rosemary out of the garden. All but two of the employees are family. I noticed this trend whether it was at the hotels, restaurants or the wineries. I just find that amazing in today's world. The only downside to hotels in Italy is that the beds are really, really hard and the wifi is spotty no matter if you are on a hillside or in the center of Rome. The best wifi reception at this hotel was in the lobby area so most of the guests were downstairs in the evenings having a drink and checking their emails. My husband face timed his mom so he could see our son play in his basketball game one night. Some of the hotel staff watched it too! It's such a relaxed atmosphere than what we are used to and we enjoyed every minute of it. We spent three days touring Chianti, Montepulciano, Montecino, and San Gimignano. Chianti was our favorite wine. We learned that Chianti Classico is made in a certain region of Chianti and that you should always look for the rooster label for verification that it is made in the Chianti Classico region. The first winery was a small family owned winery that isn't open to the public except through appointments. It's also a B&B for guests that want to experience the farm life that is called an agriturismo, which is becoming popular in Italy. Our front desk person recommended them and called ahead to set up the appointment for us. It was such a different experience. They have a pig farm, bees and olive groves in addition to the vineyards so we were also served fresh meats, olive oil and honey. We were brought a food course with each glass of wine. I learned that in Italy wine is always served with food. You will generally be served bread with olive oil and balsamic, a caprese salad and salami and prosciutto in that order. Another surprise is that most of the tastings are free. Of course we bought wine and tipped our host even if it wasn't expected. The wine tastings at the larger, more commercial wineries are not free but much less expensive than Napa Valley. My husband really wanted to see Montepulciano next, which is medieval town from the 13th century but has roots from the 3rd-4th century BC. I learned it's gained popularity since one of the Twilight movies was filmed there. I guess I need to see Twilight now, but we were there for the Vino Nobile wine. It's what the nobles of Italy drank, hence the name. We didn't have much time so we went right to one of the oldest wineries and founders of vino nobile wine, Contucci. They have been making wine since 1700. Honestly, you can tell the age when you taste the wine. Chianti is the easiest to drink, but this wine was the most interesting. We also took a small tour of the old winery. I'm kicking myself for not taking pictures of the town, but I found one online of the city streets. We headed to Montecino next to try Brunello. The towns of Montecino and San Gimignano looked just like Montepulciano so we concentrated on the outskirts to tour the vineyard wineries rather than the tasting rooms in the towns. We went to Poggio Antico to try the brunello. It was good, but we still love Chianti best. Of course we bought a bottle from each winery. I noticed sometimes I try wine at home and I have a completely different experience than I did at the winery. The views were amazing here and check out these trees! When we went to San Gimignano we went to a larger winery with multiple vineyards all over Tuscany. 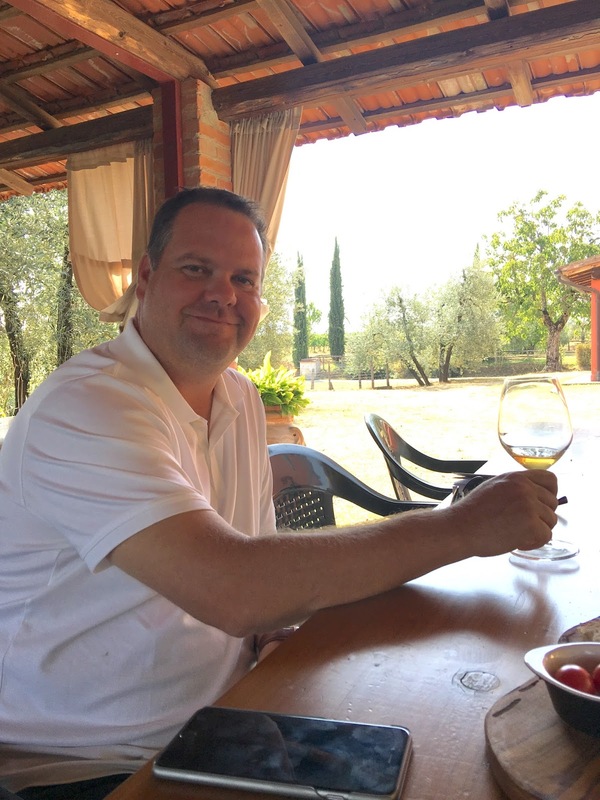 It was a nice experience because we tried every variety of wine available in Tuscany. If you can only go to one winery, check this one out because you will truly get to try it all in one tasting. If you don't believe me look at all of these glasses. We ended up ordering six bottles, but Italian wines are generally inexpensive and the shipping was only 5 euros. They had the best Super Tuscans, which I thought I didn't like. What I learned is it's just a name for blended wine so they can taste completely different from winery to winery. Keep in mind we had three and half days in Tuscany so it sounds like we were drinking a lot, but it wasn't that much. We share tastings when we can and I definitely ended up leaving most of the wine on the table at the last tasting. As much as we tasted we probably drank less than we normally do because we were concerned about driving. My husband had less than a glass in combination with multiple courses of food, but that was ideal anyway due to trying to tour the towns in the heat. One of those towns was Siena. 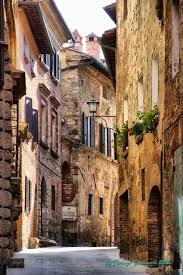 It's also a medieval town, but much larger than the others in the countryside of Tuscany. If you want to stay in a city and be central to wineries this is perfect. Fresh meat anyone? I have to admit I was practically a vegetarian in Italy. The meat was a little too fresh. I tried to eat the salami, but there was something about the smell I couldn't handle. My husband ate mine for me at the wineries and I stuck to the bread and veggies. Our last winery was one we noticed from a sign. I recognized the name as a hotel and winery we almost booked so we decided to stop in. The wine was okay, but everywhere you turn is a photo op. It's combined with the tiny town of Ama and so quaint that I would have spent all day drinking wine on the terrace if it hadn't been over 100 degrees. We didn't visit many wineries this trip because the visits are typically longer than a typical tasting in Napa, and the wineries are far apart. I didn't mind as long as I got to visit each region for the experience. It's definitely a place we could visit multiple times and have a different experience each time. I'd love to come back one day, but French wines are next on my list! We were off to Rome next and I have to admit I was dreading it a bit. I knew it was going to be hot with long lines to see the Vatican and Colosseum. I wasn't wrong. We decided to take the cut the line tours. The first tour we booked was for a 3 1/2 hour tour of the Vatican. That was a bit long, but we did get to see everything and got an informative tour by an experienced guide. We went through the museum of ancient Greek artifacts first. These statues made me miss my three boys, but I swear I saw the middle statue in the Louvre years ago. I need to look back at our Paris pictures to be sure. We did see the Sistine Chapel, but they don't allow pictures so I don't have any to show you. There were a few tourists sneaking photos. There was no way I was going to catch the attention of the Vatican police. They.are.intense. My favorite part is when they would yell "silencio" over a microphone since talking isn't allowed. It immediately silenced the crowd. I need to try that with my kids! I was a little underwhelmed by the Sistine Chapel. It wasn't nearly as impressive in person as it was in videos and pictures. St. Peter's Basilica was amazing though and you could take pictures without feeling like you'd be tackled to the ground. There were a few Chinese tourists that tried to jump over the ropes to break the line and I was a little nervous because they didn't seem the least bit fazed by the intimidating Vatican police. They finally backed down so it ended up okay. I loved that our hotel was five minutes from the Trevi Fountain and the Pantheon. The Spanish Steps were a 10 minute walk. The Colosseum was a 20 minute walk from our hotel. We decided on a 60 minute tour after enduring half a day at the Vatican the day before. It really could have been completed in 30 minutes. It's exactly like you think it would look like by the pictures. It was interesting to see Rome, but I don't think I will visit a second time. It's too busy, hot, dirty and the food wasn't nearly as good as the other regions of Italy. 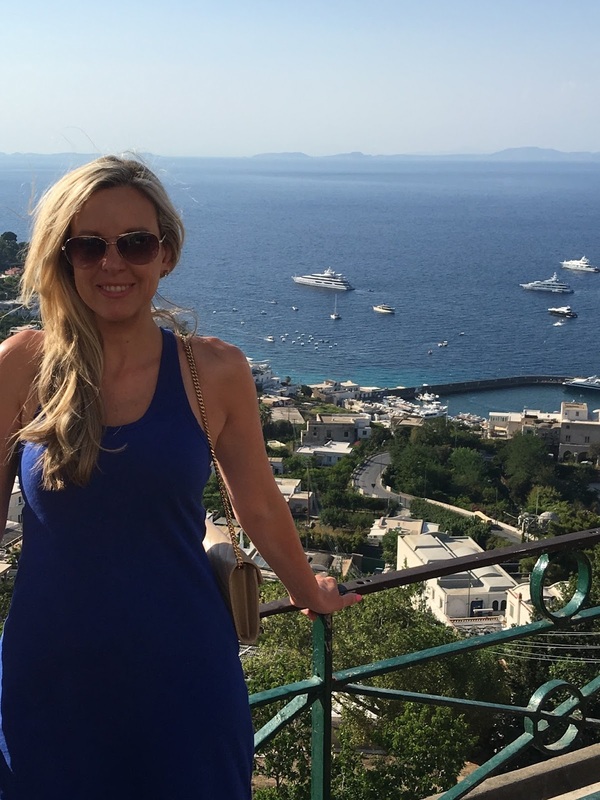 I would love to visit Tuscany and Capri again one day. Both of are right out of a postcard. I didn't mention cost, but Italy can be very affordable. The hotel rooms or vacation rentals average $100-200 a night. That's much cheaper than what you can get in our own state. Also, my husband and I put all of our expenses that we can on a United Airlines card for points so we are able to get our airline tickets for free. I don't want anyone reading this thinking that a trip like this is out of reach when we actually spend so little! We came home a week before the kids go back to school so it's been a little crazy around here lately. I oddly feel re-energized and can't wait to start on a few projects this week. I've also been continuing to wake up early courtesy of partly still being on an Italian time zone. I've been making use of that time by working out every morning since I got used to waking up early and walking many miles a day. I am trying to keep that momentum going! What a thorough review of the all the spots you visited on your trip, I felt like I was right there with you! Such beautiful scenery and stunning landscapes not to mention the winery's. What a once in a lifetime opportunity, thank you for sharing. It was an amazing experience that I'll never forget! I'm so glad you enjoyed it! Wow! These photos are all so stunning, so happy y'all had such an amazing time!!! The wine looks heavenly! 🙌🏻🍷 Loving all your cute outfits too - you look like you fit in perfectly in Italy! Thanks for sharing this interesting blog with us. My pleasure to being here on your blog. I wanna come beck here for new post from your site.